Several prominent trumpet players and other well-known jazz artists are expected to perform next Monday in New York City at a memorial service for the late trumpeter Lew Soloff. Here is the announcement from the Manhattan School of Music. 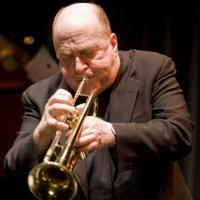 New York – A celebration of the life and music of Lew Soloff (Feb. 20, 1944-Mar 8, 2015) is scheduled for Monday, June 8, 2015 at the John C. Borden Auditorium, located at the Manhattan School of Music. This event is free to the public and begins at 7:00 p.m. Doors open at 6:15pm for early seating. Lew Soloff, an essential player in the New York jazz scene since the early 1960s, created numerous musical associations during his career and many of those whose life he touched will come together to share their love and talent on this special evening. The musical program for this celebration is under the direction of Soloff’s close friends Paul Shaffer and Noah Evans, son of the late Gil Evans, Soloff’s “musical godfather.” Some of the artists taking part include; Wynton Marsalis, Randy Brecker, Jon Faddis, Jimmy Owens, Cecil Bridgewater, Chris Potter, Ray Anderson, Gil Goldstein, Danny Gottlieb, Mark Egan, Sammy Figueroa, Manhattan Brass, Jeff Berlin, Fred Lipsius, Jeff “Tain” Watts, Pete Levin and Jesse Levy. More information on the final line-up will be announced shortly. Please visit lewsoloff.com for up-to-date details. For the Rifftides post about Mr. Soloff’s passing, go here.